Our flexible hydraulic fracturing tanks are designed to offer large capacities in a single storage tank. Fabric frac tanks sizes range from 20,000 gallons to 210,000 gallons. Flexible frac tanks feature a fabric design that has equipped them for use in a wide range of oilfield liquid storage applications. While offering high-capacity, these tanks also have a durable outer structure that offers a high puncture resistance as well as a high resistance to outdoor elements, environmental factors, and other industrial hazards. We strongly suggest a secondary containment berm to contain spills from accidental cuts, as well as a repair kit to fix any issues on-site. Material: The urethane material is a highly resistant and durable option that offers increased strength, as well as a high resistance to hydrocarbons, fuel and water. Standard thicknesses of these materials include a 32 ounce and 34 ounce option. Fittings: Standard fittings found on this flexible tank include dual 4" fill/discharge ports, 2" x 2" floor drain ports, hoses, and 2" diameter vents. Capacities: Standard frac tank sizes range from 20,000 to 210,000 gallons. Some of the most frequently used sizes include 50,000 gallons, 100,000 gallons and 210,000 gallons. See the list below to find the equivalent barrel storage of these tanks. This can greatly decrease your energy, transportation and shipping costs and one collapsible frac tank can equal several steel units. For example, a 150,000 gal portable frac tank holds about 3,750 US oil barrels which is equivalent to approximately 6 conventional steel frac tanks. 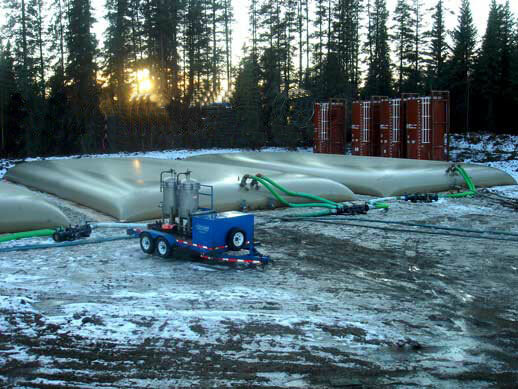 The flexible frac tank is made from several different material options that equip the unit for storage of hydraulic fracturing fluids and waste storage. This has allowed tanks to be used in various aspects of the oil, gas, and mining process.